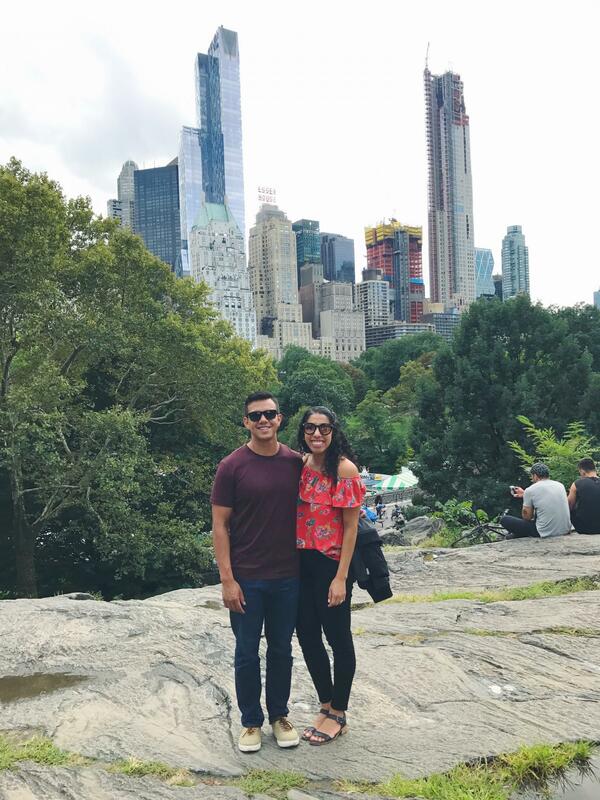 Last month, Eric and I visited The Big Apple to spend time with friends and explore the city for his first visit! While I had been multiple times, it was exciting to see everything through fresh eyes with E.
It’s no secret that we have a constant case of the travel bug (ex: Jamaica, San Francisco, London, Madison), so visiting some of my NYC favorites while finding new ones together was lots of fun. 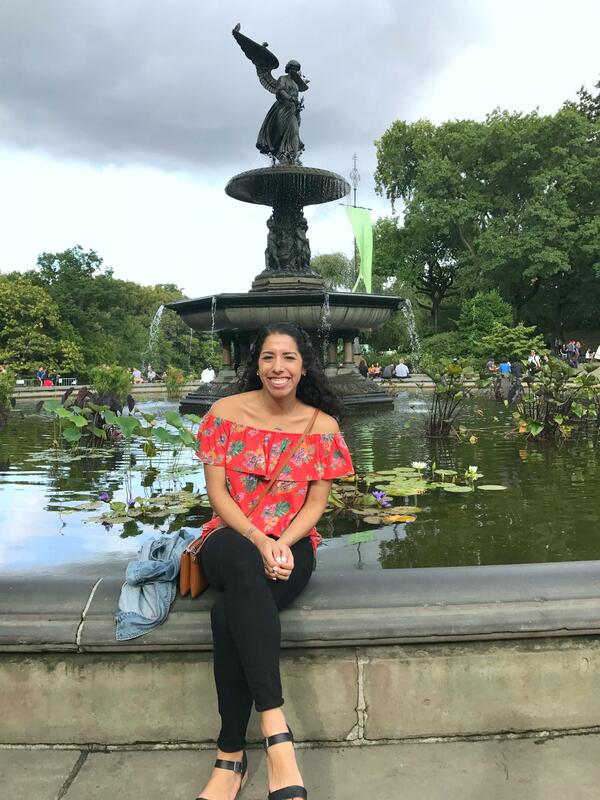 Below is the guide to New York City I pulled together in hopes that it comes handy if you’ve got a trip in your future! Times Square (Night + Day) // This famous spot is a spectacle at any time of day, but I honestly prefer it at night! 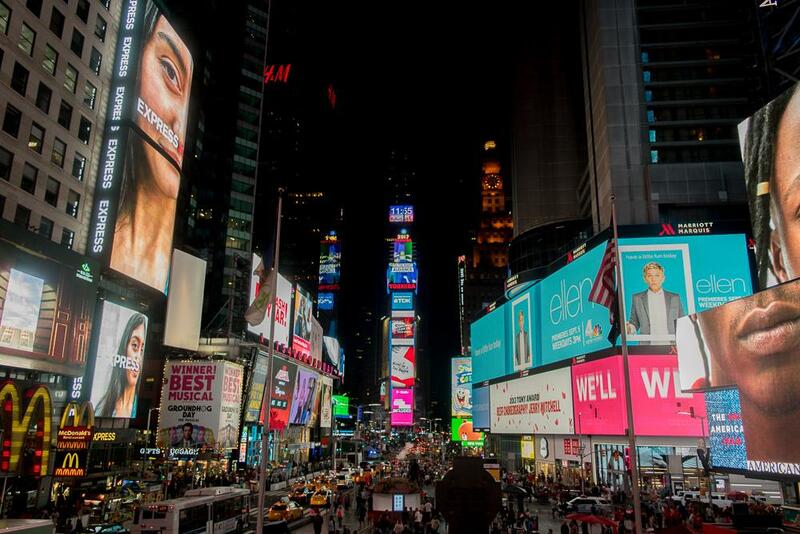 We got in late and ended up walking through Times Square around 11:30 pm, when it was a little less busy than evening primetime right before and after broadway shows. Seeing all the lights and different people gathered to Oooo and Aww is truly something else! To that point though, it’s worth seeing during the day too! Since it gets so crowded and tourist heavy, I’ve never stayed for too long at once. If you’ve gone, when’s your favorite time to see it? PIZZA // You know how they say dolla make me holla? Well that’s true here. I was told anytime I see a sign for dollar pizza, do it – and I’ll tell you the same thing. I actually prefer NYC style pizza (large, hand tossed thin-crust) to Chicago deep dish (shhhh, don’t tell!). 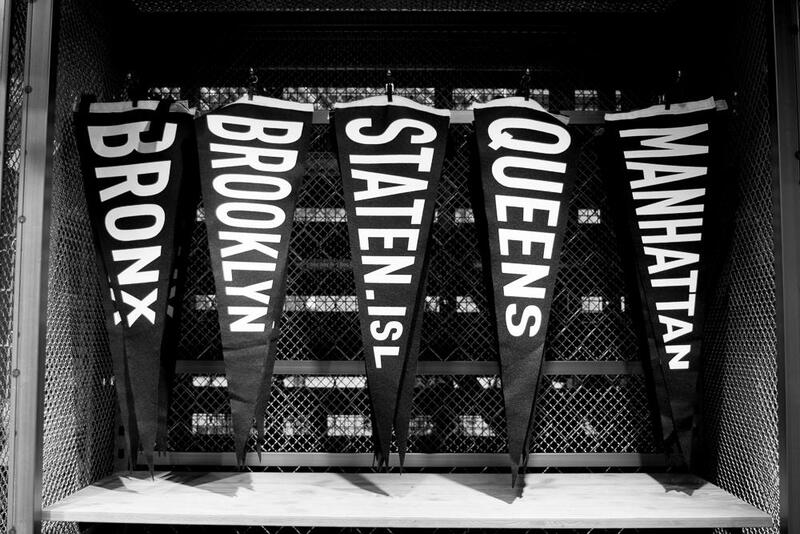 There’s various spots for it all around Manhattan, especially around the Times Square area. E and I straight up walked to two $1.00 locations for dinner one night. We’re so fancy, I know. 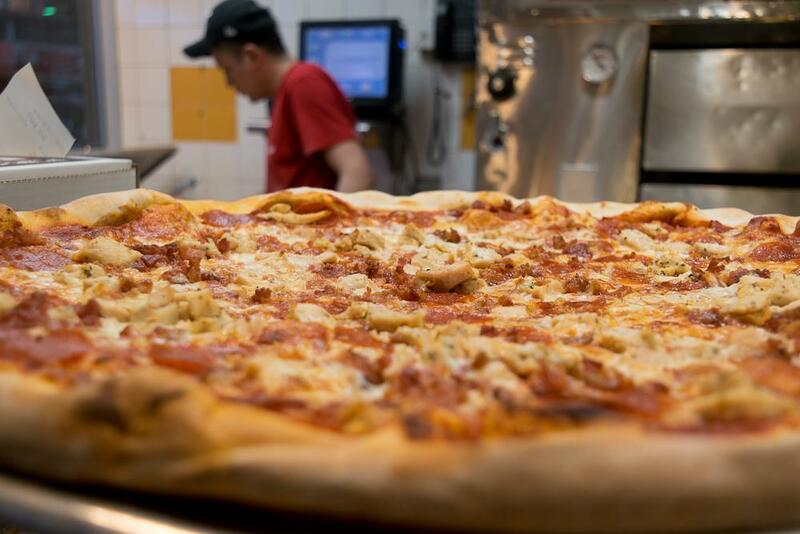 Keep in mind, quality varies of course, and for even just a few bucks you can get a slice with more toppings. All I’m saying is tasty pizza for cheap? SOLD. 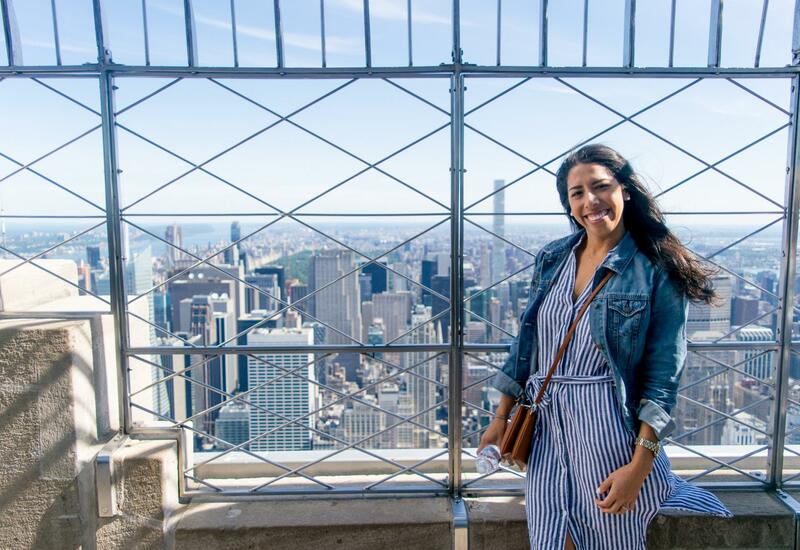 Empire State Building // Probably my favorite touristy thing on my guide to New York City! 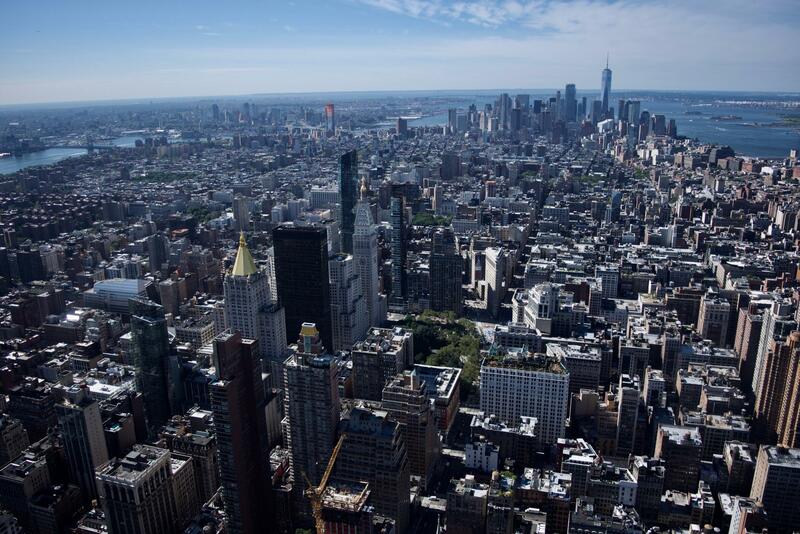 Nothing beats these views from the middle of Manhattan, giving you a breathtaking sights on all sides. 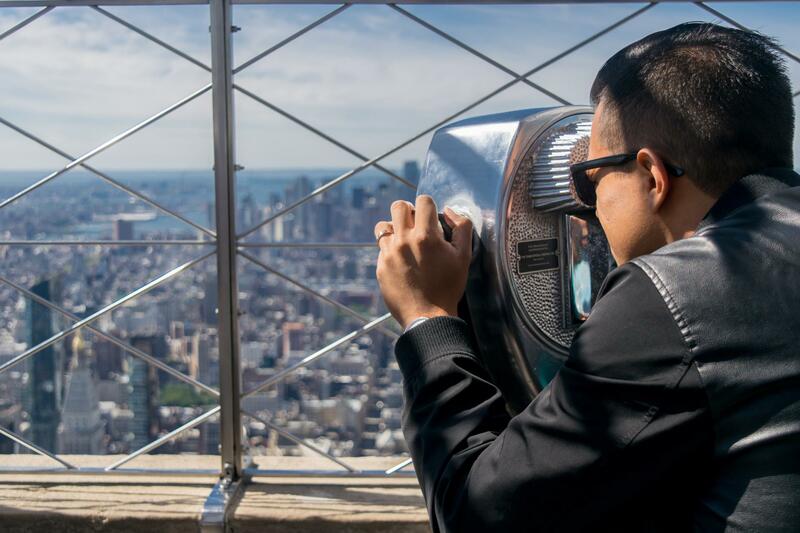 In addition to the views, the history throughout the tour is fun to learn about – especially for engineers like E! I’d recommend buying your tickets before hand and going earlier in the morning. Eric and I showed up around 9:00 am on a Friday with no major waits. 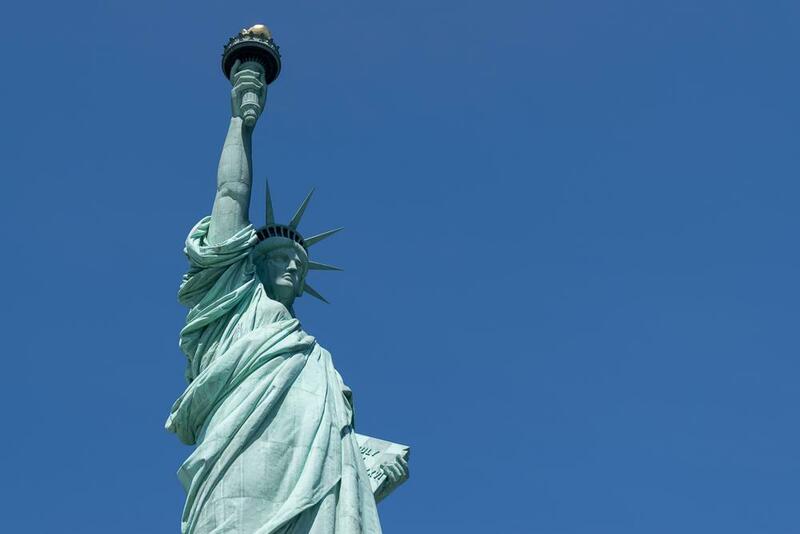 Statue of Liberty // If you’ve only got time for a couple famous attractions, this is the other I’d recommend in addition to the Empire State! 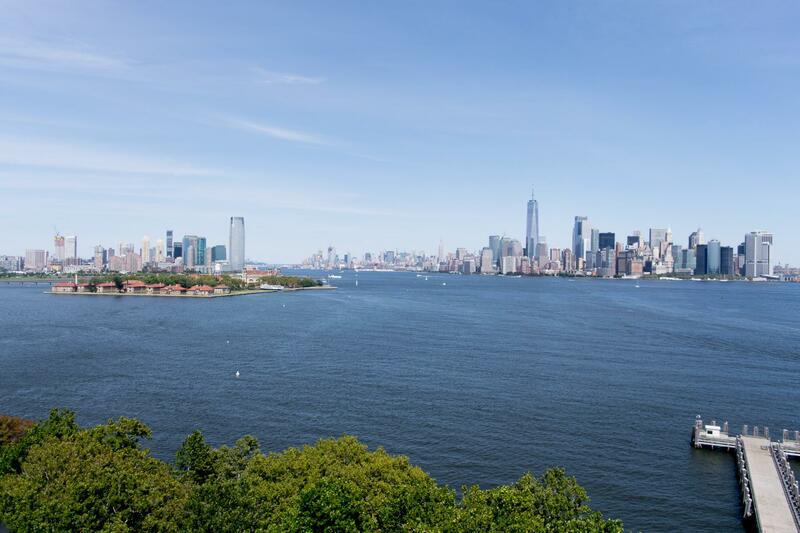 You get two for one – the Statue of Liberty + Ellis Island – with your ticket and the cruise out to the islands includes spectacular views of the NYC skyline that people pay way more for elsewhere. 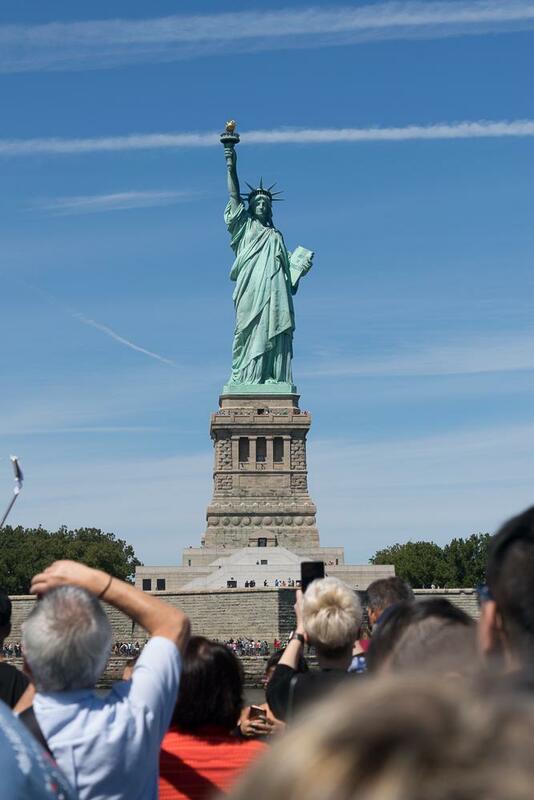 Lady Liberty is just so iconic, it was a classic E had to see without hesitation! Cruise time slots book up ahead of time, so I’d recommend buying tickets a few weeks out. Tip: Time on your ticket is when you arrive to go through security, not when your cruise takes off! Thanks to my resident photographer + husband at Benavides Photography for most of the snaps you’ll see in this post! The Shop at NBC Studios (Rockefeller Center) // If you are a major fan of any NBC shows (think Friends, Parks & Rec, The Office, SNL, etc. ), then you have to stop at this store inside Rockefeller Center – another famous building and plaza to at least walk by in itself! The NBC store has memorabilia for every show out the wazoo. 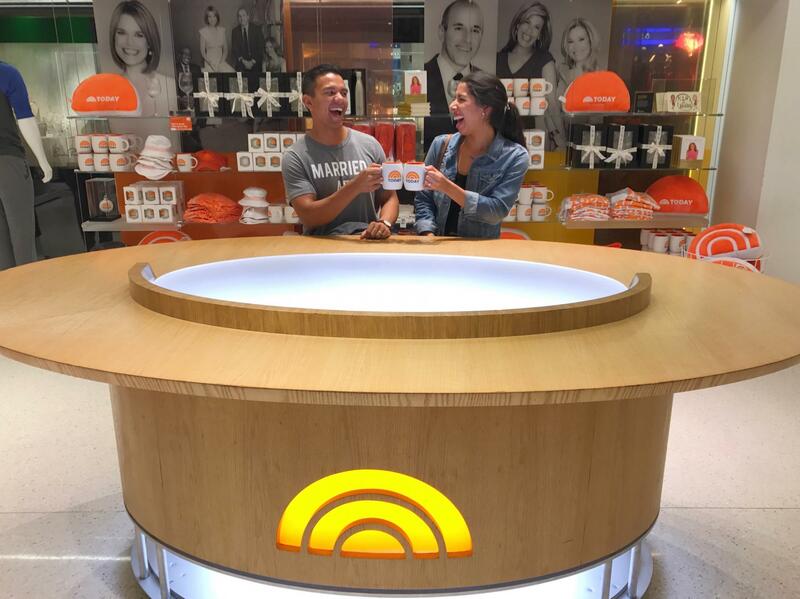 Did you guys hear E and I are the new Today show hosts? 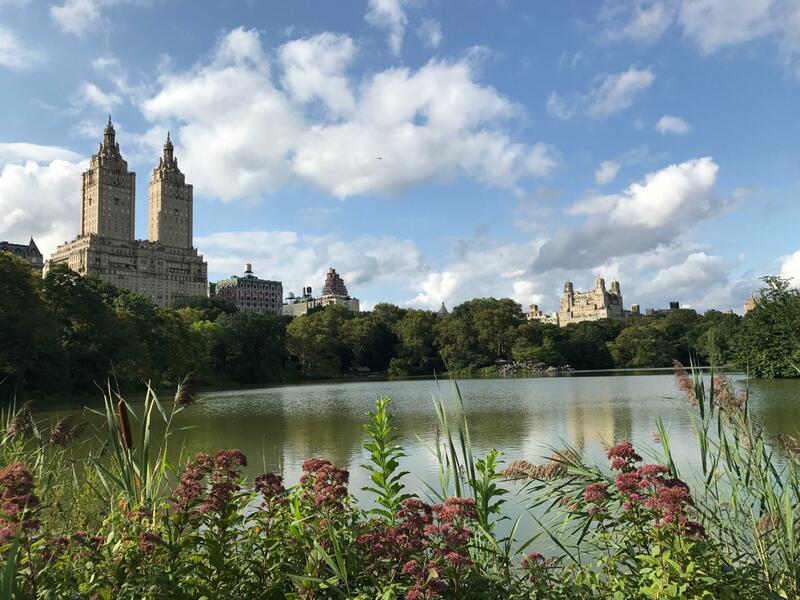 Central Park // It’s huge and it’s beautiful! Give yourself a couple hours to walk around and get lost, but don’t plan on covering the whole thing. Keep a look out for some cool rocky spots where you can get great photos of the city behind you and the Imagine Mosaic in honor of John Lennon. 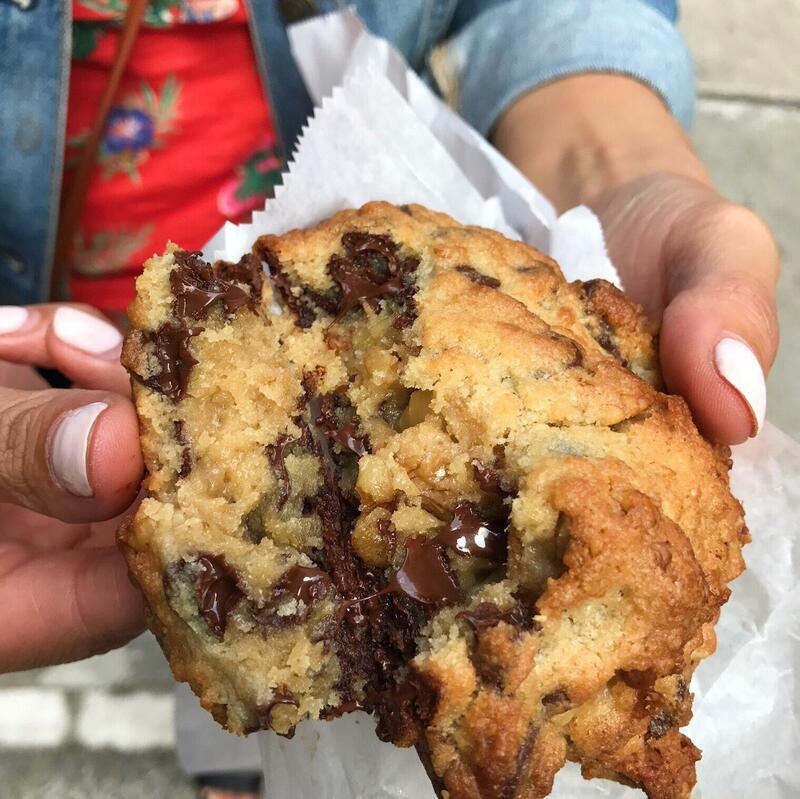 Levain Bakery // While your by Central Park, you have to stop by this little bakery and get the BEST COOKIES EVER! Seriously, the only explanation for these treats is magic. Just kidding, but maybe. Don’t let the line fool you, it went by fairly fast when we were there and the chocolate chips are waiting. 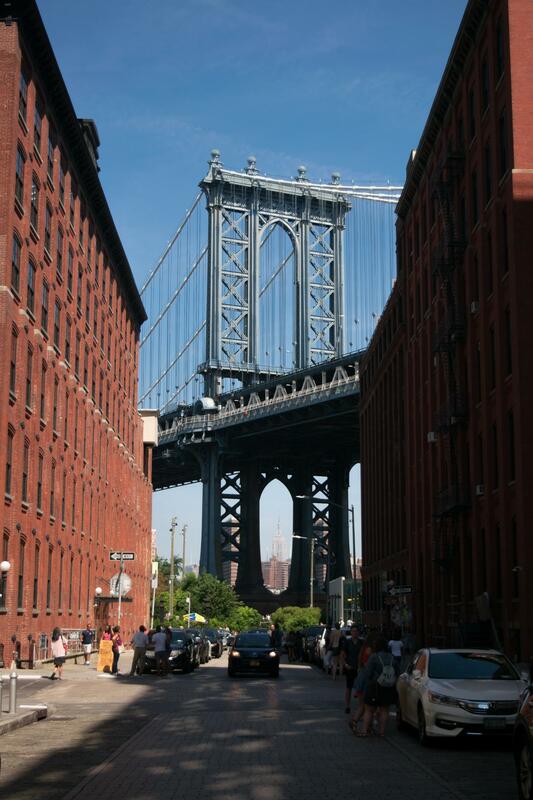 Brooklyn // I highly recommend carving out time in your trip to visit Brooklyn! Just walking around you’ll find lots of unique shops and restaurants (ex: Walter’s cute brunch, Bittersweet coffee). 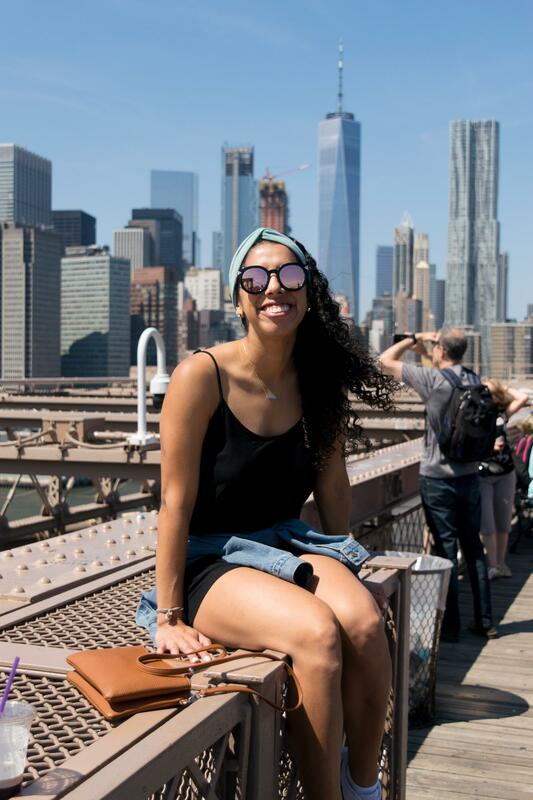 If nothing else, you should at least walk across the bridge for some beautiful views – was and still remains one of my favorite things in the city! 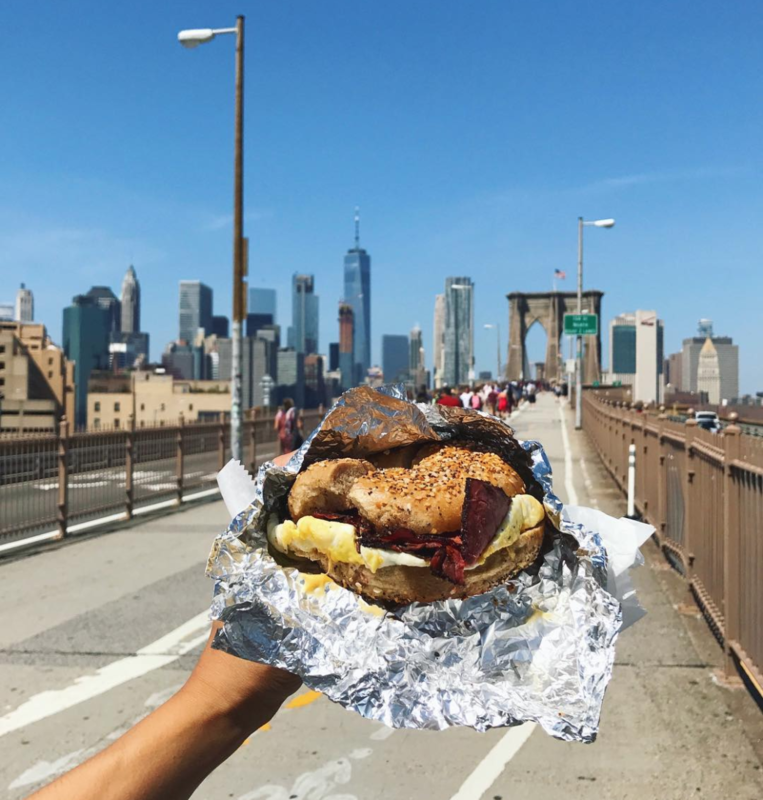 On the Brooklyn side of the bridge, you’ll find Le Bagel Delight in Dumbo (omg delicious at these breakfast bagel, you guys) and this famous spot at Washington and Water Streets! A photographer’s (aka E’s) heaven. 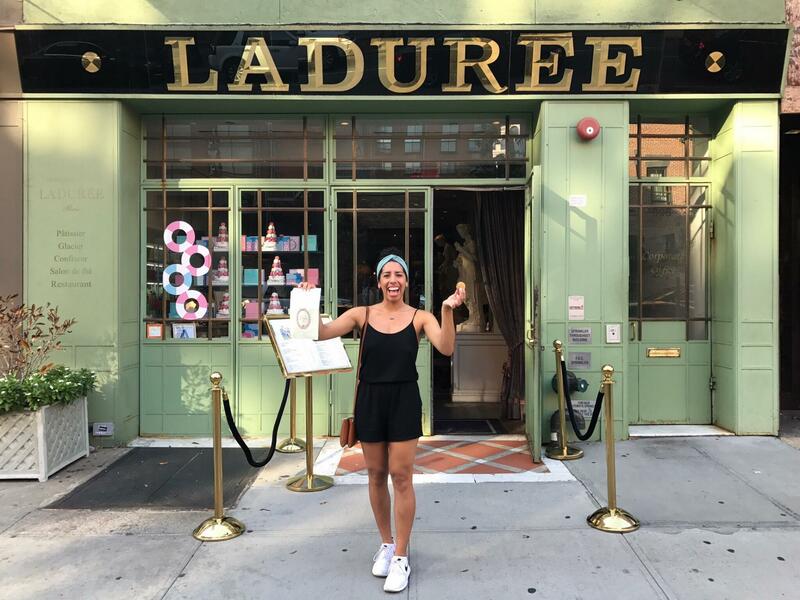 Laduree // This macaroon shop that originated in Paris is the real deal and has two locations in NYC. We swung by the Soho location to sample a tasty treat! 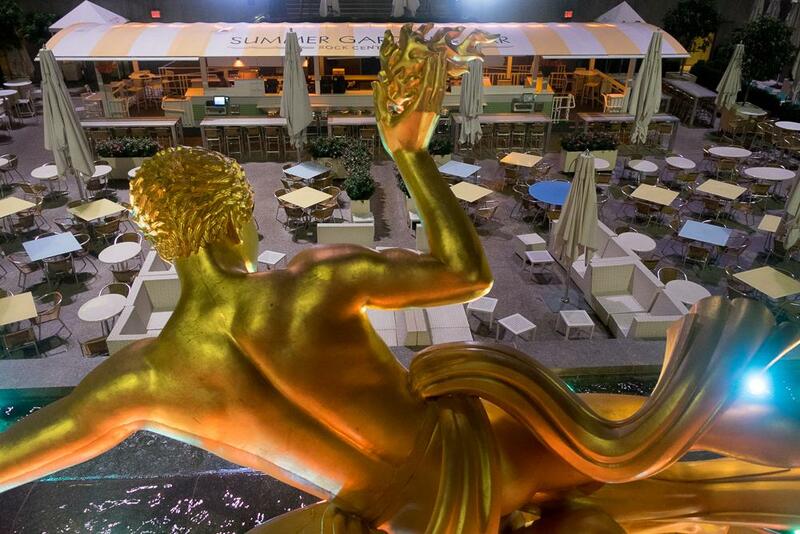 You can also sit in their beautiful garden patio for some champagne. Perfect if you’ve been walking around all day and need a boost! 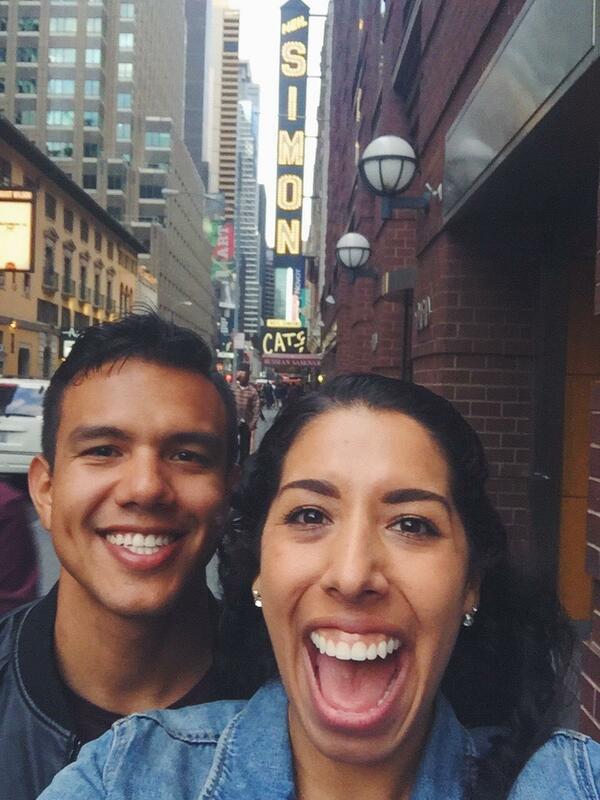 Broadway // You can’t go to NYC for the first time (or anytime in my book) without seeing a show on Broadway! From timeless classics (Wicked, Phantom of the Opera, or Lion King) to more recent hits (Hamilton, Book of Mormon, Dear Evan Hansen), I feel like there’s something for everyone. E and I love Broadway shows and wanted to see something new for us both. We ended up at Cats, which was veryyy interesting. The costumes and dancing were amazing, and while it’s a classic, we did both find it a little odd, so it wouldn’t be my first recommendation haha. I would, without a doubt, suggest one of those I mentioned above! Tip: If you aren’t set on one show, save money by showing up at one of TKTS booths around the city (we always go to the Times Square location) and purchasing discounted same-day theatre tickets! 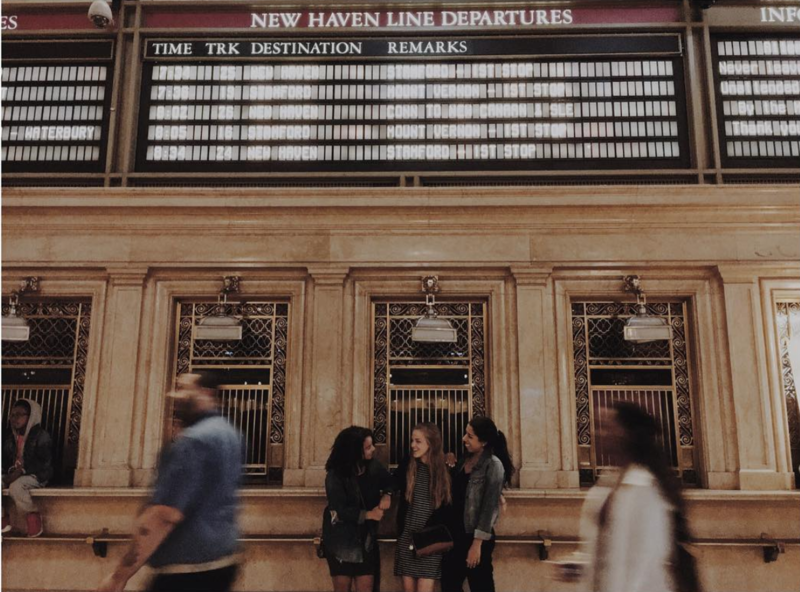 Grand Central Station // This is such a pretty New York spot. From details like the starry ceiling to the antique feeling departure counters, it’s worth checking out if you’ve got a thing for buildings with character. Thanks Rach for this pic! 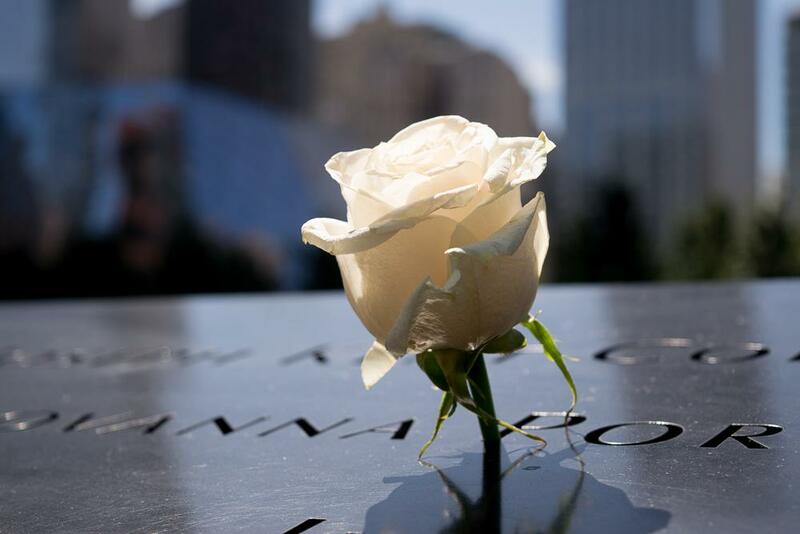 9/11 Memorial // This if of course a special place to honor those our country lost on this terrible day. It is beautifully done and emanates sweet feelings of hope and love. 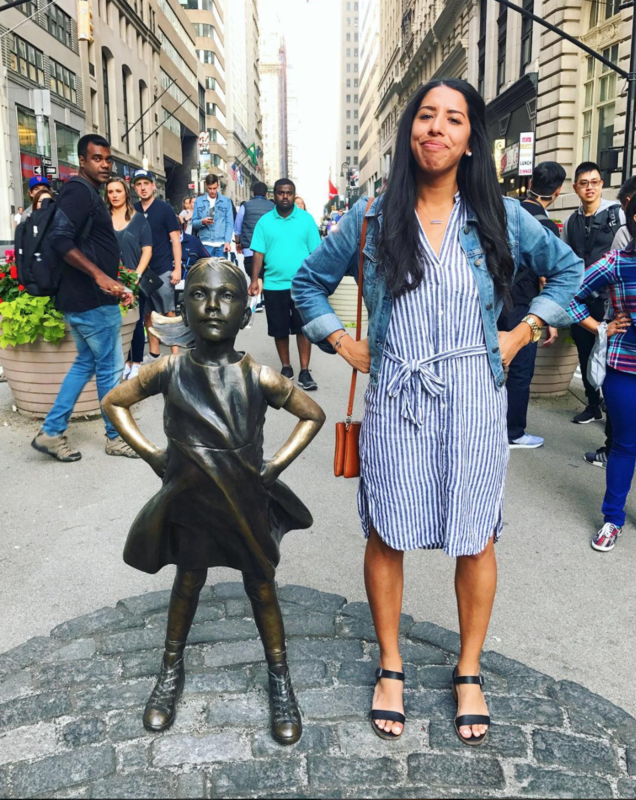 Wall St. // A famous spot to check off your business savvy person’s checklist – or if you’re all about that woman power and want a pic with the Fearless Girl. Now I want to hear from you! Been before and have other good spots I should add to my list next time? Tell me in the comments! P.S. A special announcement related to E’s photography coming soon. 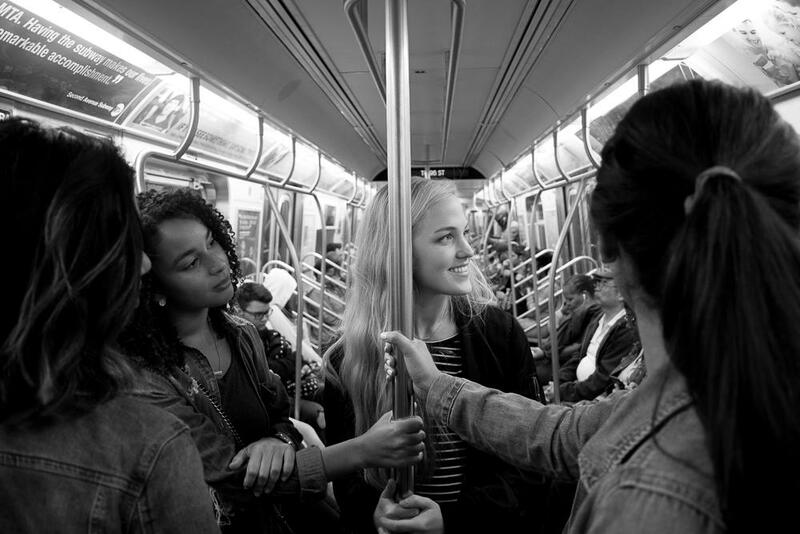 🙂 Sharing a couple black & white behind-the-scenes favorites from his NYC snaps in the meantime! Looks like you had so much fun! Love all of the outfits, especially the striped dress. Your pictures bring me back! I made a trip there 7 years ago. My husband has never been before. I need to take him for sure. The food there is amazing! 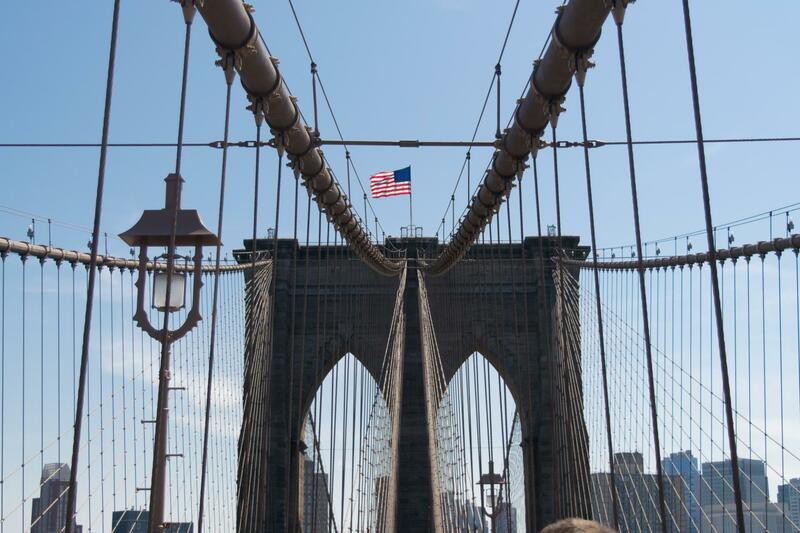 next time I got to NYC I’m doing the Empire State building, the Statue of Liberty and Brooklyn! I didn’t do any of those when I visited 6 years ago. 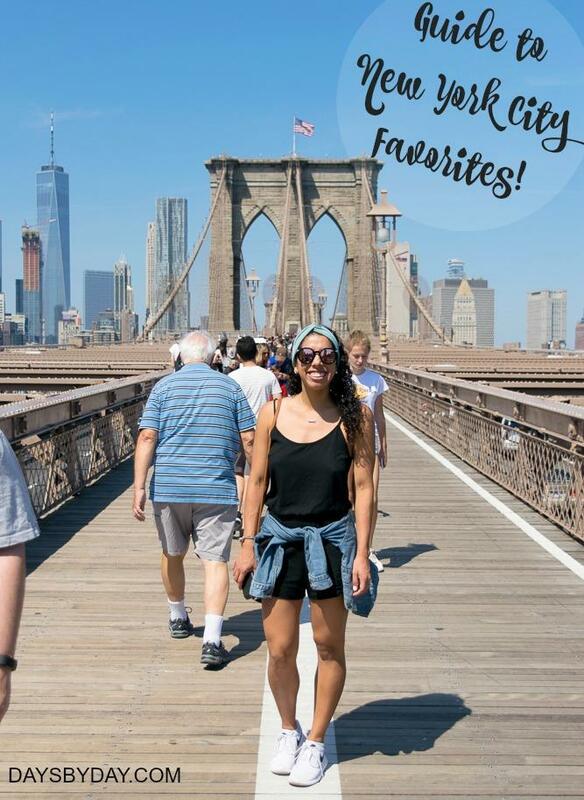 That’s a great city guide! I like your personal recommendations! I’m headed there next weekend, this was a PERFECT post for me! Thanks for sharing!